When Should You Call The Pros? Your AC unit is a lot like your car. However, most people treat it like the fridge and other areas of your home that are usually ignored. It provides comfort day in and day out and is worked more often than your vehicle, but since it’s out of sight, it’s also out of mind and is usually forgotten about until it breaks. And then, chaos ensues. The problem with a broken AC is that it never happens on a cool morning or a comfortable night – it always breaks in the blazing heat of summer or the humid, muggy nights. Realizing that your home’s heating and air system has broken in the middle of one of these spells is a great way to completely ruining your day. We want to keep you as happy (and sane) as possible. 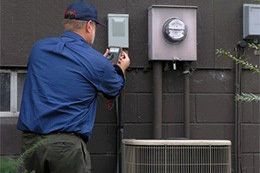 If you need emergency repairs, you can count on Charlotte AC repair services to be there as soon as possible. We’ll fix your problems and get the unit going as soon as possible. However, we should stress that maintenance is the key to avoiding having to call your Charlotte AC repair company. Keeping the unit working properly is the best way to stop it from overheating, overworking, and eventually breaking. Doing small maintenance things like cleaning or changing the filters is something that most of us can figure out with the right tools. Cleaning the unit is also a great way to keep it running. Some light, regular cleaning could be as simple as wiping down the filters and maybe blowing out the interior dust. However, for anything more extensive and tedious like vent and duct cleansing, feel free to call the Charlotte AC repair business.